Hanazono began his training in classical Japanese music and dance. His mother had been a traditional Japanese dance performer, and when she resumed performing Hanazono took an interest as well. At the age of 12, he gave up his dream of being a professional athlete and started lessons in the Bando-ryu style of Nihon buyo. Nihon buyo is a traditional Japanese performing art that combines dance and pantomime. Male performers are typically clad in kimono and hakama, a Japanese skirt for formal wear, and carry folding fans known as sensu. 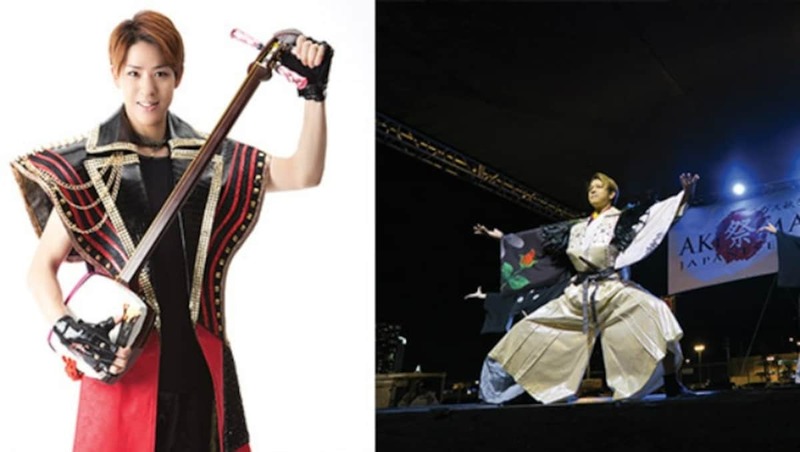 For some of his routines, Hanazono has also adopted sleeveless superhero-type costumes and other eye-catching outfits accompanied by prop swords or a shamisen, a three-stringed traditional Japanese musical instrument he learned to play in the dynamic improvisational Tsugaru style made popular by the Yoshida Brothers. While Hanazono has observed some resistance to his performance style in Japan, where audiences appear to have more fixed expectations about Japanese dance, he has found that other foreign audiences, particularly in Korea and the United States, are openly receptive to his new style. “Many people tell me how cool my performance was,” he says with a smile. One of Hanazono’s crowd-pleasing techniques is to incorporate Western music into his routines, and U.S. audiences rave when he performs dance moves to Michael Jackson’s “Dangerous” and Lady Gaga’s “Judas.” In the same way that Jackson used his black fedora for flair, Hanazono achieves a similar effect by spinning, throwing and catching his sensu. Yet he never lets spectators forget his background in Japanese classical arts, such as when he ended a recent performance in Los Angeles by kneeling in traditional seiza style and bowing low. “The audience went wild and gave me a standing ovation,” he says. Hanazono says he is still learning and improving. “When I look back at video of dances I’ve done, I realize how much I could have done better.” Hanazono intends to keep refining his technique, and also sees potential in incorporating Japan’s latest stage technology and computer graphics into his show. Both at home and abroad, Naomichi Hanazono is challenging conventional notions of dance and giving his audience a new perspective on Japanese culture.